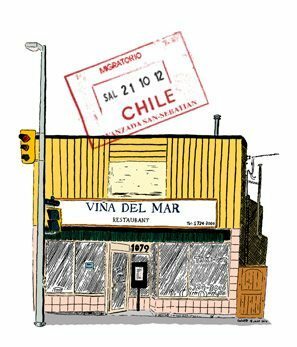 The couple who own Vina del Mar want you to try everything they make. Hugo, especially, who spent years catering for embassies and fancy parties, wants Ottawa to experience un sabor Chileno. The menu is simple and written in Spanish, with descriptions in French and English. If you pronounce the words correctly, Hugo praises you, smiling and cheering at your attempt. The restaurant has become well known for its hearty pastel de choclo, a savoury Chilean pie made from ground beef, olives, egg, chicken, and cornmeal. But locals also arrive for the hand food: beef and chicken churrascos or chacerros with sautéed green beans and mayonnaise. Both, for the bold, are eaten with a frothy pisco sour made from strong Chilean liquor.